It might feel like fall is around the corner, but we still have about a month of summer to go. And while I’m an autumn lover at heart, I can’t help but relish the summertime season when I’m presented with a dessert (or breakfast!) like this. Our culinary team’s hand baked scones with strawberries and blackberry marmalade is a dish that presents beautifully and tastes even better, and we can’t think of a better time to try it than this long weekend. 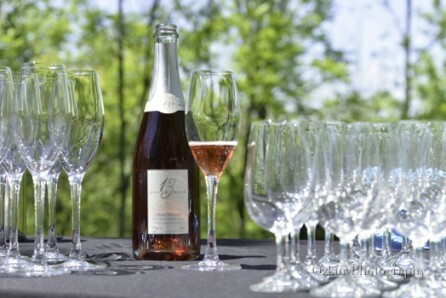 And because no dish is complete without a beverage, why not try pairing it with a dry sparkling rosé from the Niagara region? Our pick: 13th Street Cuvée 13 Brut Rosé. Line a baking pan with parchment paper, and preheat the oven to 425°F. Whisk the flour, baking powder, salt, and sugar. Pour the vanilla over the mixture, and then pour the cream, stirring gently and adding just enough to make a dough. Divide the dough in half, and pat each half into a 5 1/2″ circle about 3/4″ thick. Take each circle and brush with heavy cream. Lay your dough circles on the baking sheet, and then cut each into 6 wedges. Pull the wedges apart a bit, but leave them in a circular pattern with no less than 1 inch of space between each wedge. To help them rise, sit the pan of scones in the freezer for about 15 minutes. After 15 minutes, take them out of the freezer and bake for about 15 minutes until they are starting to brown. Ensure they are baked through. Remove the scones from the oven and let cool. Cut your scones in half and spread Devon cream on the bottom halves of the scones. Store cooled scones airtight at room temperature for several days; freeze for longer storage. To refresh, microwave individual scones very briefly; or place scones on a baking sheet, tent with aluminum foil, and reheat in a 350°F oven for 10 to 15 minutes, until heated through. Our wine selection for this dish: 13th Street Cuvée 13 Brut Rosé. Photo credit: Thirteenth Street Wine Corp.